Johnstone Hall is an on campus dorm that was built in 1954. There were originally 6 sections A, B, C, D, E, and F. Johnstone A and A Annex is the only section still standing. B and C were the first sections to be torn down in 1992. They stood where McCabe and Holmes are now. Section D was abandoned as a dorm in the mid 1990s. Sections D, E, and F were demolished in the summer of 2002, leaving the open sloping field beside Harcombe and the Greek Quad. There were Annex sections added to Johnstone A and F.
Because Johnstone A and A Annex were separated from the rest of the complex by the Union, women were housed in this section beginning in the 1980s. The rest of the complex remained exclusively male. 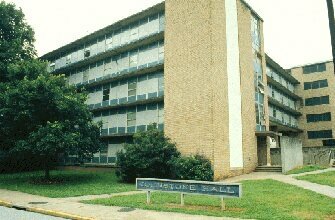 After Johnstone D, E, & F were demolished, Johnstone A became co-ed housing. The Johnstone complex replaced three crumbling barracks (Nos. 1, 2, and 3) dating from Clemson's earliest years, and the original Johnstone Hall was the name given to Barracks No. 2 in July 1946 by the Board of Trustees in honor of State Senator Alan Johnstone of Newberry, a Life Trustee in the early years of the college. Johnstone was notorious for being a dump with its thin sheet metal walls and drafty rooms. The walls were so thin that you could hear people talking in the next room and alarm clocks could be heard 5 or 6 doors down in the morning. Each room had its own sink and the closets that were built into one wall included rifle racks. Johnstone was built using a construction technique known as "Raised Slab" construction. The building was essentially built from the top down. Each floor consists of a concrete slab with the "in-floor" elements (walls, bathrooms, etc.) being built after the floor itself was in place. During construction, they poured the top floor first and raised it up to build the floor below it. This process was repeated for each floor. Johnstone was one of only three construction sites ever built using this technique, and was the last one condemned, though there is one remaining that had not been demolished as of spring 2010. The Johnstone Hall complex became a model for college dormitories, implementing a new raise-slab construction method, a practice which was featured in many architectural magazines at that time. This method - the Youtz-Slick "lift-slab" method - lifted reinforced concrete slabs onto columns with hydraulic jacks. These slabs weighed 224 tons and were nine inches thick, 122 feet long and 43 feet wide. Today, only one of the original Johnstone buildings is still standing on the campus. The Johnstone Annexes were not constructed in this manner. The Annexes were similar in design to the Shoeboxes. This page was last modified on 9 April 2010, at 16:59.